Never Enough 'Gangnam': K-Pop Video Is YouTube's Most-Viewed : The Two-Way Gangnam Style, by Korean pop star PSY, is now the site's most-viewed video of all time. With more than 810 million views and numerous spoofs, "the velocity of popularity for PSY's outlandish video is unprecedented," YouTube said. Korean rapper PSY is responsible for the song Gangam Style, whose flashy and humorous video has brought K-pop to new ears. 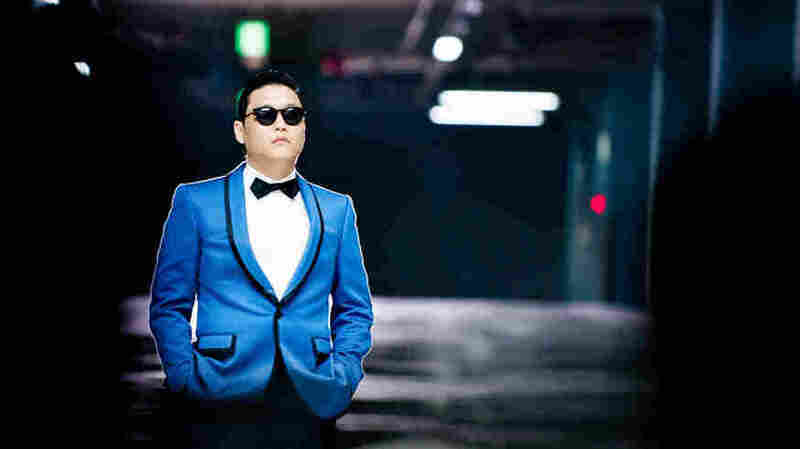 South Korean pop star PSY has galloped his way to the top of the YouTube charts with his music video, Gangnam Style. As of Saturday afternoon, YouTube says, it is the most-viewed video of all time on the site. It now has more than 810 million views. "The velocity of popularity for PSY's outlandish video is unprecedented," YouTube says in its Trends blog. Gangnam Style dethroned Justin Bieber's music video, Baby, which took the most-viewed title in July 2010. Other top videos include On the Floor by Jennifer Lopez and LMFAO's Party Rock Anthem. "Gangnam is a territory in Seoul, Korea. I describe it as noble at the daytime and going crazy at the night time. I compare ladies to the territory. So — noble at the daytime, going crazy at the night time — and the lyric says I am the right guy for the lady who is like that." Psy's dance includes a signature move that represents trotting on a horse, holding the reins. In the goofy and colorful video, Psy moves between solo dances through city streets to group dances in a horse stable, and from sun bathing bright pink shorts to relaxing in a spa. As the video was picked up around the world, it inspired a number of spinoffs, featuring everyone from world leaders to students. Chinese dissident and activist Ai Weiwei gave his spoof a political twist, and it was quickly banned in China. Gangnam Style also won the Best Video Award at the 2012 MTV European Music Awards earlier this month. NPR's Zoe Chace reported in October that the pop video "is not some viral fluke." She says it's the product of a build-up of the country's distinct music industry that has been in the works for two decades.